Christmas Eve has arrived. The streets are less crowded as people gather in homes to celebrate this special season. 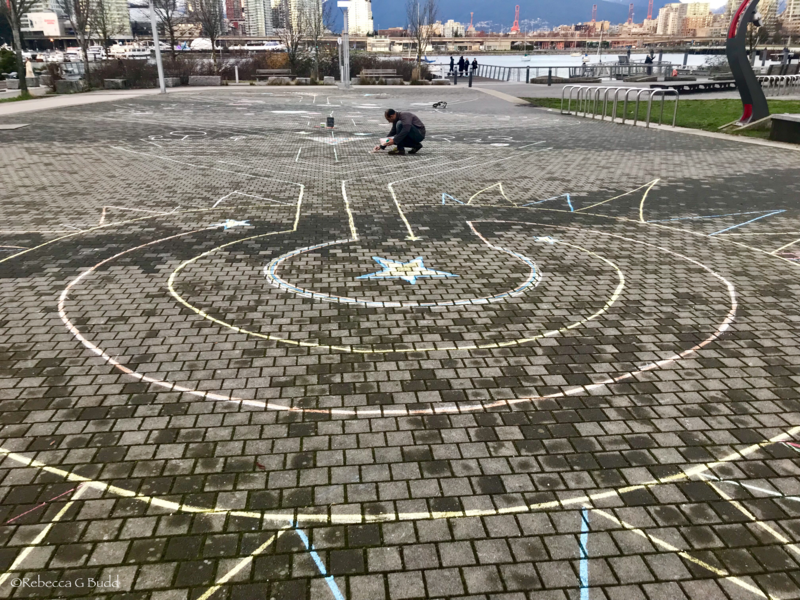 Walking home via the Vancouver Seawall, my husband and I came across a lone artist working with absolute focus on a complex Christmas tree labyrinth of brightly coloured chalk against a large open walkway in Olympic Village. Without doubt, it is a labour of love, a gift to our community. The definition of labyrinth is a complicated irregular network of passages or paths in which it is difficult to find one’s way. 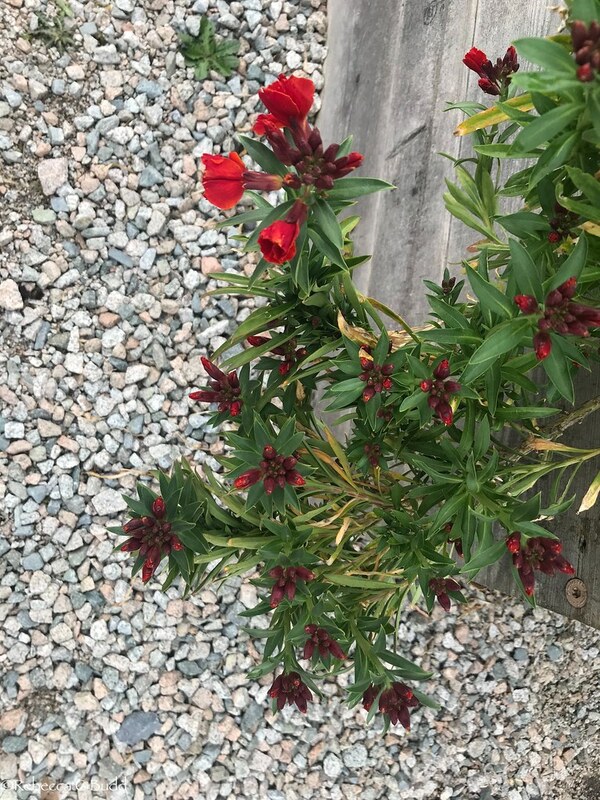 Walking the maze – I couldn’t resist the challenge – was a reminder that we experience complexity and ambiguity. Many times, we face crossroads and competing alternatives that shroud the road ahead. And yet, it is the challenge that makes life interesting, the moments meaningful. Time passes, new opportunities arise. As we look forward to 2019, may we embrace the labyrinths that come our way. 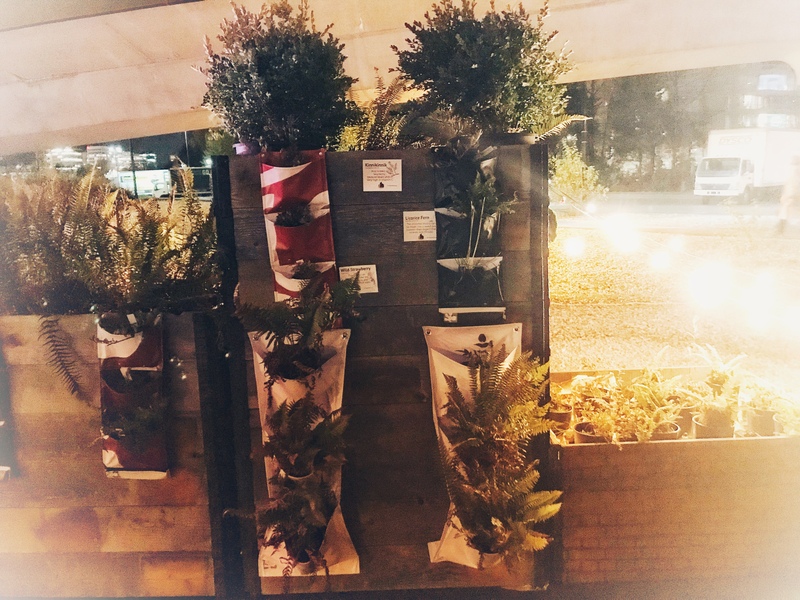 This entry was posted in Around Vancouver, Art, Christmas, LadyBudd, Street Art and tagged Christmas, Labyrinth, Olympic Village. There is a special place in our hearts for artists who live big, bold and fully committed to their creative mission. 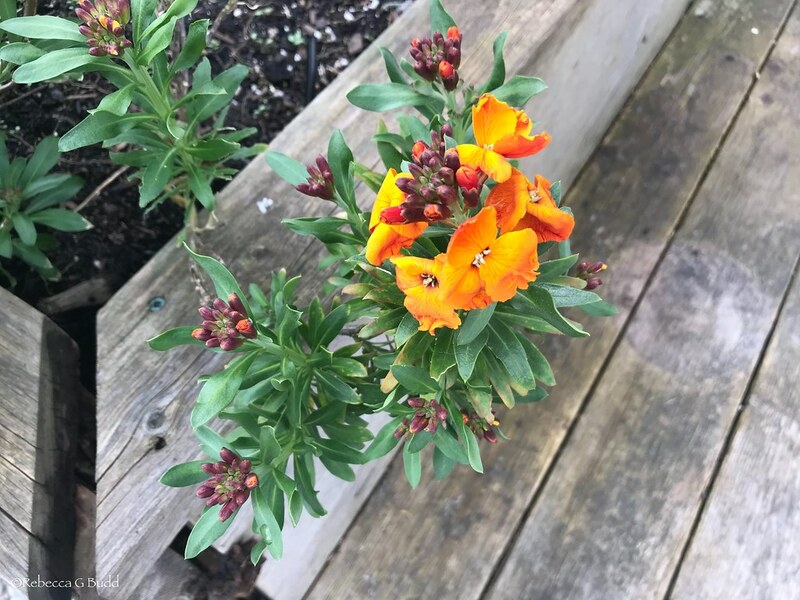 Their vibrant lives act as a strident call to action that prompts, or rather demands, that we follow their example and explore, experience, and share our personal creativity. We are the voice of this time and place, the generation whose moment has come to write our story within the narrative of humanity. Spanish artist, Okuda San Miguel is one of those bright lights who motivate us to seek a deeper understanding of where imagination takes us. His work is recognized for its geometric prints and multicolored style and design. There are mythological undertones that speak to the need for meaningful dialogue. Okuda San Miguel’s mural, “Canada Secret Mountains” has come to Vancouver and resides on a building at 325 West 4th. The stories of the British Columbia’s west coast, embedded with Okuda’s insights, has been written for all to see and experience. May we answer an artist’s call to action and, today, live big lives. This entry was posted in LadyBudd, Okuda San Miguel, Street Art, Surrealism, Urban Art and tagged Canada Secret Mountains, Creativity, Mythology, Okuda San Miguel, Vancouver. 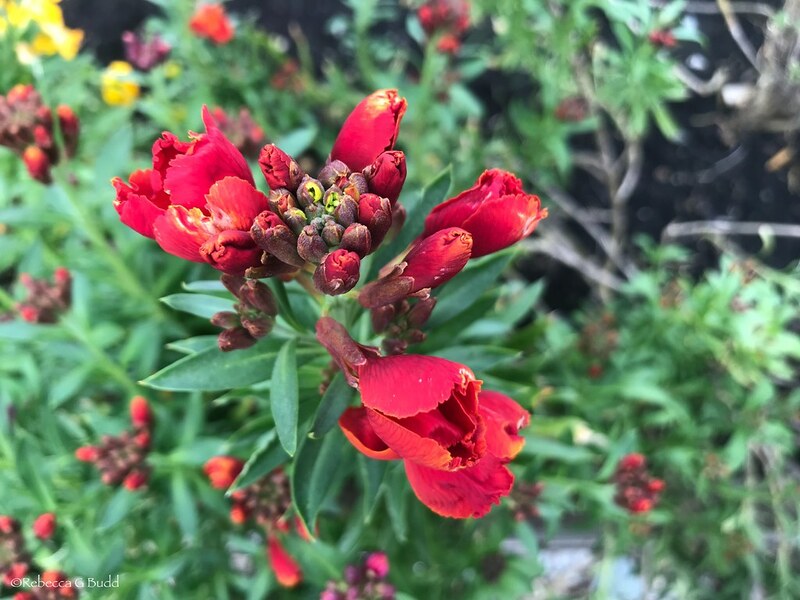 The ubiquitous compound, consisting of two atoms of hydrogen and one atom of oxygen in every molecule, supports our very existence and safeguards our world and all inhabitants that call earth their home. Water is important – we recognize this axiom. Do we understand our responsibility to that truth? In our reality, we are facing profound and complex questions of who will share the clean water? the fresh air? and nutritious food? We are a global community with global agendas that will demand our full participation and collaboration. 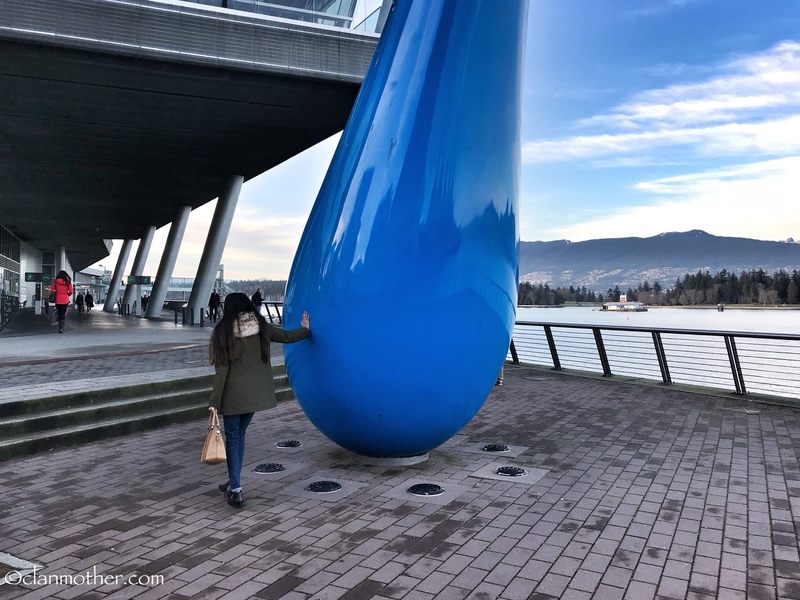 This entry was posted in Around Vancouver, Art, INGES IDEE, LadyBudd, Sculpture and tagged INGES IDEE, The Drop, Vancouver, Water. The idea of permanence imbues feelings of safety and security. Stability, durability, endurance, constancy – these words allow us to indulge in long-term planning and undertake big dreams that will happen sometime in the future. The assumption of indefinite unchangeability suggests that we have time enough for everything because what is today, will surely be here tomorrow. Tomorrows are fresh starts and they chose their own destinies. All we are given is a reasonable expectation or likelihood of what may, or may not, occur. 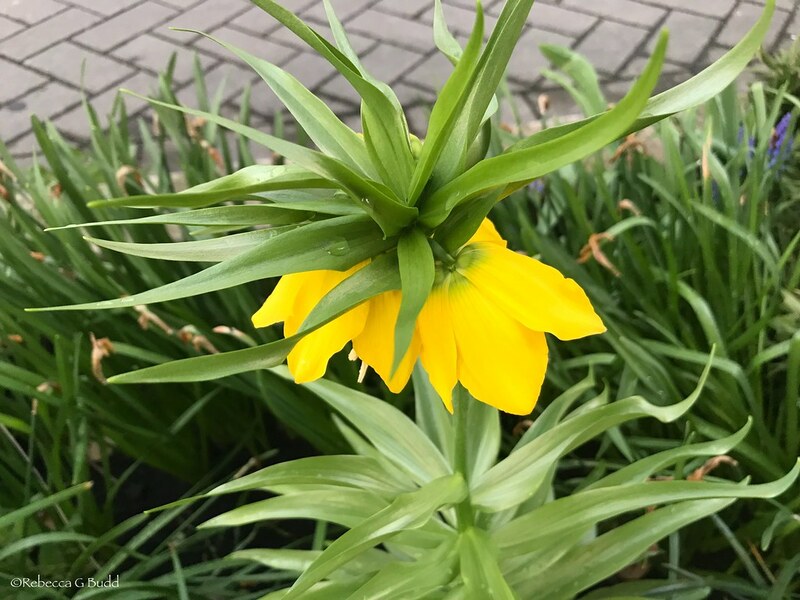 For all our supposed need for permanence, however, what lies within us is something far more profound – the need to explore, to experience the extraordinary, to live big lives. Now, in the present. Not in the opaque and unknown future. One thing that remains steadfast is our desire for community, for belonging, for a place to call home. 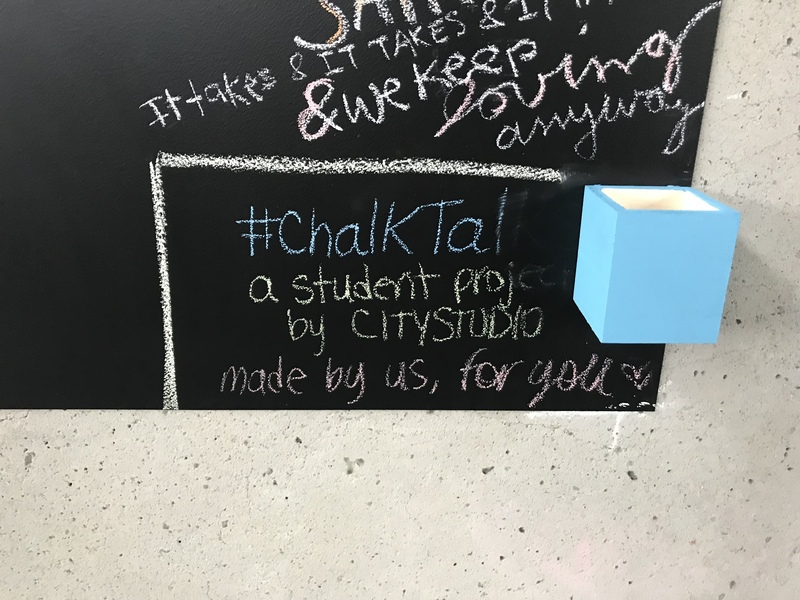 #ChalkTalks – a student project by CityStudio “made by us, for you” appeared in the afternoon and left the same evening. Thomas Merton, in No Man is an Island, wrote, “Art enables us to find ourselves and lose ourselves at the same time.” That thought came to mind when I walked under a bridge and experienced this remarkable temporary art installation. Within a few hours, the crowds dispersed, and the music stopped. 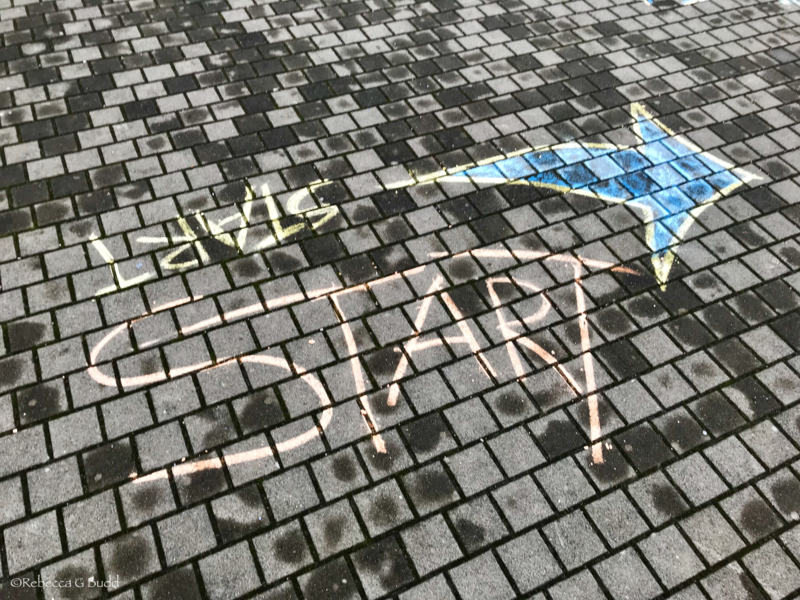 By morning, all that remained were a few chalk messages left on cement walls. 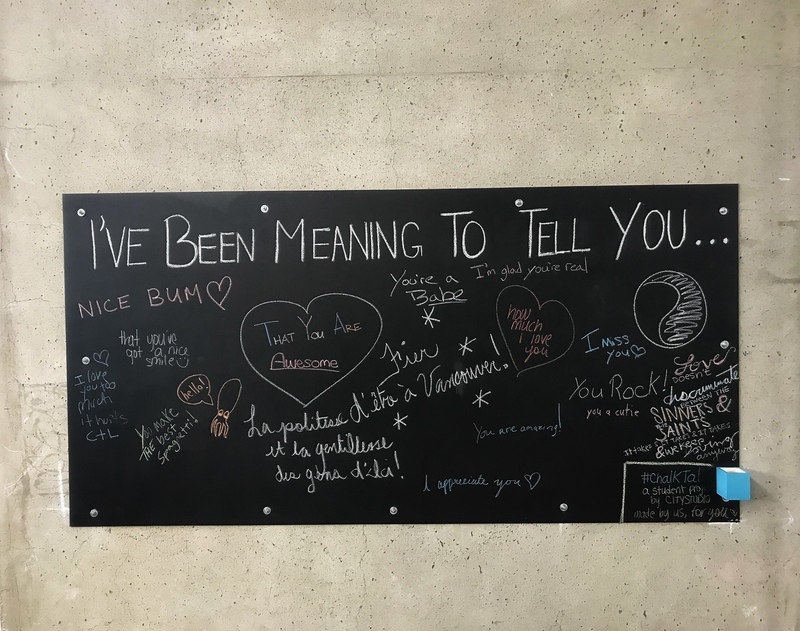 And yet, what these students said through art, remains with those who experienced the moment. Perhaps that is the only permanence we need. 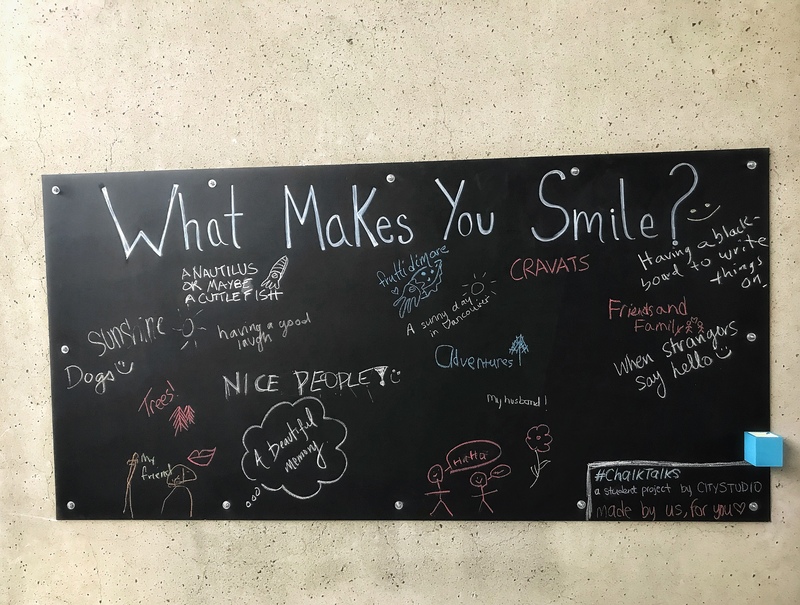 This entry was posted in Art, LadyBudd, Temporary Art, Thomas Merton, Vancouver and tagged Permanance, Temporary Art, Thomas Merton, Vancouver. It was a late night in early September. The summer warmth lingered, still unwilling to give way to a cooler season. The muted lights of Vancouver’s downtown cafes spilled onto the streets, mingling with laughter, voices and the aroma of fragrant spices. In the midst of a vibrant night scene, one street commanded a hushed audience fully engaged within a mythological world of light and music. 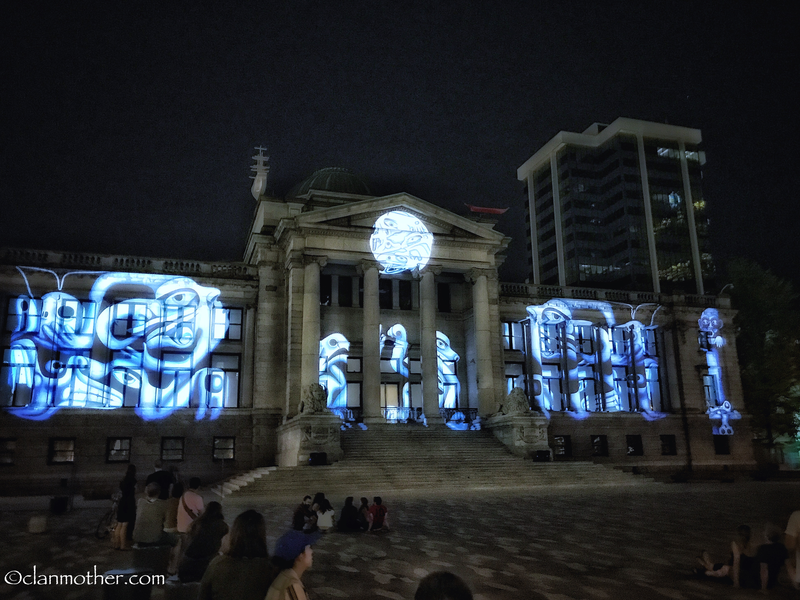 It was opening night of the FAÇADE Festival 2017 that began at 7:30 p.m. and would end at Midnight. 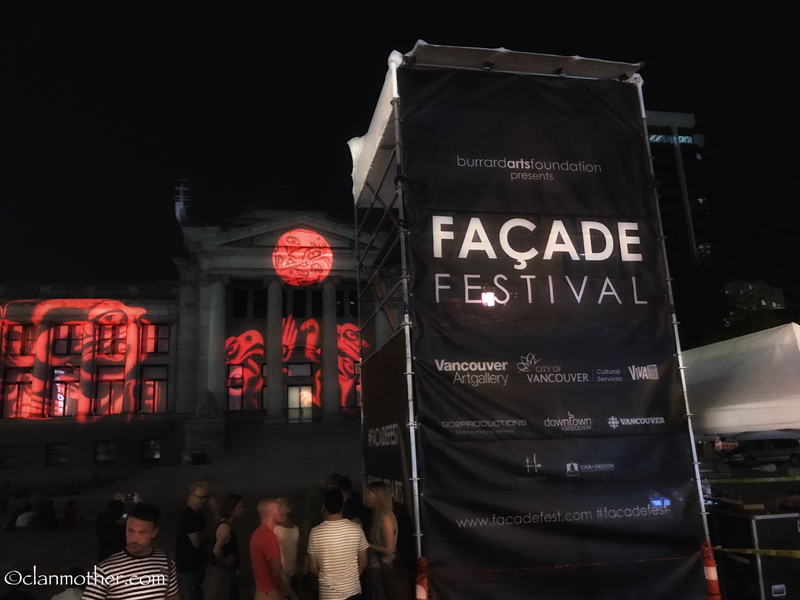 The FAÇADE Festival is a week-long public art production presented by the Burrard Arts Foundation in partnership with the Vancouver Art Gallery. 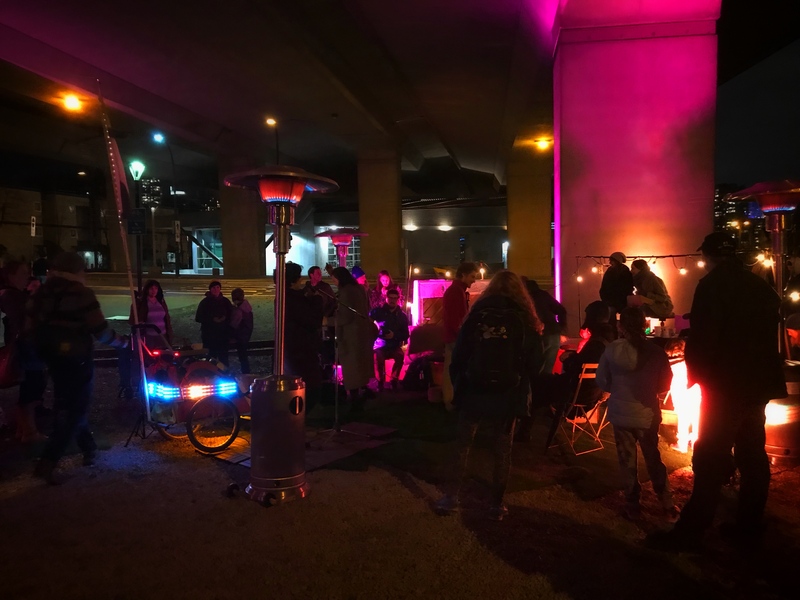 Jane Jacobs once wrote, “Cities have the capability of providing something for everybody, only because and only when they are created by everybody.” Artistic expression is the foundation of bringing communities together. When we recognize and share our creative spirit we are building innovative cities that will continue to thrive within a vast global world. 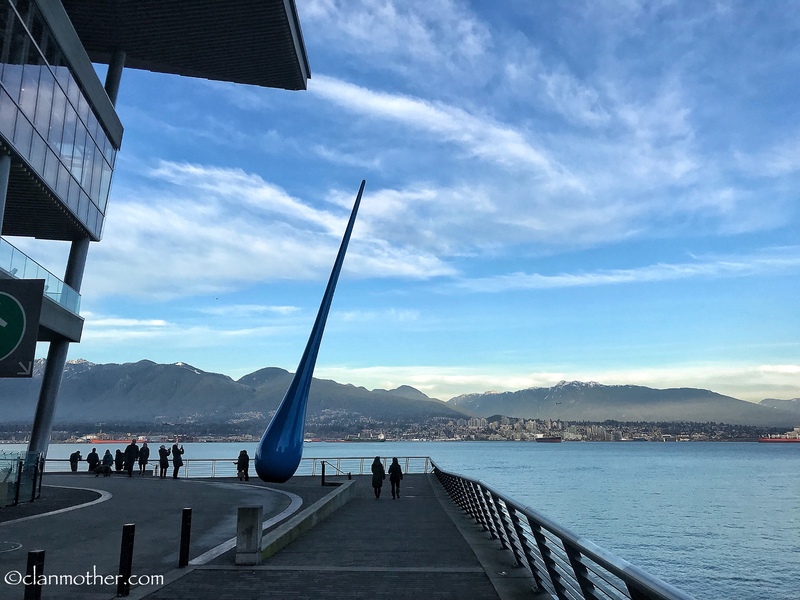 This entry was posted in Art, FAÇADE Festival 2017, Festivals, LadyBudd, Public Art, Vancouver and tagged Burrard Arts Foundation, FAÇADE Festival 2017, Public Art, Vancouver Art Gallery.